Your apartment might be bigger, but is it this organized? 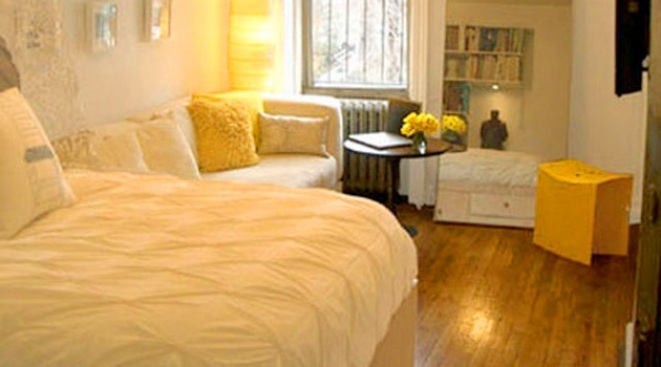 At 210 square feet, the apartment's resident, Kevin, says a light color scheme is essential. You think your space is small? Kevin Patterson, 32, lives in a 210-square-foot studio on the Upper West Side, and his decorating prowess has earned his home the title of New York's best "teeny tiny" apartment as awarded by apartmenttherapy.com. Patterson works as a project manager at a real estate development firm to pay his $1,550 rent, the Daily News reported. He's used every inch of the apartment for storage -- think drawers under the bed, shelves across the top of the wall -- and used a mostly white color palate and mirrors to create the illusion of space. Kevin Patterson shows off his decorating skills, emphasizing the importance of hidden storage. He really doesn't have a choice, since his Upper West Side joint is only 210 square feet. Patterson also has three workable variations of his scheme -- an everyday setup, a plan for accommodating dinner guests, and his sofa pulls out for overnight visitors. Mao he picked up while backpacking in Southeast Asia. While his wasn't the most elaborate "teeny tiny" apartment entered into the contest, Patterson told the Daily News he thinks he got the most votes because everyone could relate to the space.